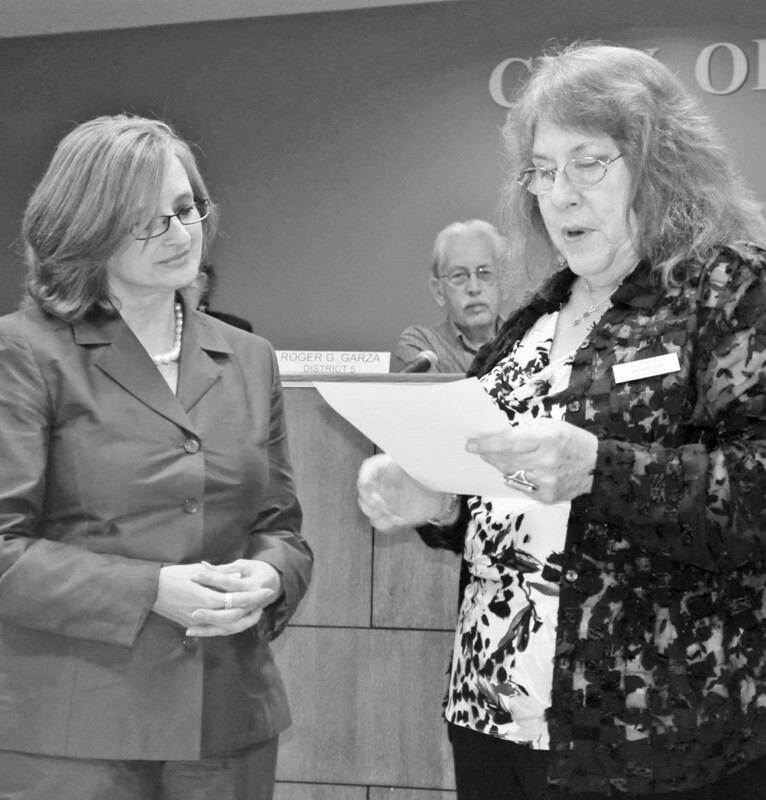 Pleasanton City Councilwoman Jeanne B. Israel (at right) presents a certificate of appreciation to Janet Jackson, for serving on the City of Pleasanton Economic Development Corporation Board of Directors. The Pleasanton City Council voted unanimously to direct City Manager Bruce Pearson to enter into a development agreement with Chaparral LLC Development for the construction of water and wastewater facilities. The decision was part of the June 20 regular meeting. Comprising the council are Mayor Clinton J. Powell, Jeanne B. Israel (Dist. 6), Roger G. Garza (Dist. 5), J.R. Gallegos (Dist. 4), Kathy Coronado (Dist. 3), Abraham Saenz (Dist. 2) and Jimmy Magel (Dist. 1). Pearson explained that to put it simply, Chaparral Development needs more fireflow into their subdivision off of Highway 97. The city has entered into a “gentlemen’s handshake agreement,” said Pearson and the development agreement was presented to the staff and tweaked by City Attorney Bobby Maldonado. What is the advantage to the city? Pearson added that the sewer line that is a part of this has provided a challenge for staff. The city will provide the labor and equipment. The developers are paying for everything else: engineering costs, administrative costs, surveying costs. “With your approval tonight, we will present this to the developer and see if we can reach an agreement and move forward. Our staff is poised and ready to go out for bids for parts and get to work as soon as we can,” said Pearson. Council awarded the bid for the Landscape and Irrigation Project at Pleasanton City Hall to Maldonado Nursery of New Braunfels, in the amount of $53,219. Pearson explained that the bids were opened on June 17 and three bids were submitted. Maldonado was the low bid. George Maldonado explained that the scope entails 22 trees, ranging from small to medium. It also includes the sprinkler system, mulch, etc. He said they will do their best to exceed the expectations. Coronado said she realized irrigation would come first. She was nervous about putting in all those trees and shrubs at this time of year. Maldonado said that is not to say they may not struggle initially. It will depend on weather temperatures and rain. He repeated that they would not install them without an irrigation system. •Preliminary plat for 281 South Homes Subdivision. This will be at the corner of Humble Camp Road and Highway 281 and will be a showroom for mobile homes. •Preliminary plat for Fairfield Inn Subdivision, behind the Whataburger. •Preliminary plat for Timberhill Unit 2 Subdivision. This is an extension of the Richter’s subdivision in Oak Forest. •Final plat for Corgey Road 3.54 acre subdivision. This plat is in the extra-territorial jurisdiction off Highway 97. The resolution was also adopted, authorizing the mayor to implement a Section 3 Program, to provide job training, employment and contracting opportunities. This is for Section 3 businesses of the area in which the Texas Community Development Block Grant Program is being carried out. Council also unanimously approved the authorization and publication of Notice of Intention to issue Certificates of Obligation. At the previous meeting, Pearson recommended the COs to buy an asphalt laydown machine to begin road repairs and eventually new road construction. Atascosa Health Center CEO Monty Small gave a presentation and presented a layout of the facility. Small explained that a year ago, they received a $5 million grant to build a brand new facility. Walt Rakowitz is the project manager. They are going to build a 20,000 square ft. brand new facility and a 4,000 square ft. building for the Women, Infants and Children program. Atascosa Health Center is also going to add more exam rooms and a state-of-theart wellness center offering hands-on cooking and promoting exercise. AHC has sites in Floresville, Karnes City and Three Rivers. They are working on something in George West. Small emphasized that the center sees patients whether they have the best insurance or no insurance. They are helping so many, especially with the current Eagle Ford Shale boom. The council also unanimously approved selling the Unit 5 brush truck to the Christine Volunteer Fire Department, as recommended by Pleasanton Fire Chief Chuck Garris. A certificate of appreciation was presented to Janet Jackson for her service on the City of Pleasanton Economic Development Corporation Board of Directors. The council unanimously granted a variance to the Setback Ordinance at 1036 Commerce Street.